If today’s dress looks familiar, that’s because it is. I wore it on Saturday. I have had people comment on how they don’t have 31 dresses or how they just could’t do this because they would be uncomfortable. Last year, I thought the same thing and that is what kept me from participating in Dressember last year. Quite frankly, if this Dressember event was only about fashion or a dress I wouldn’t be participating in it. I am not one for being fashionable (enjoying fashion is another story! I love seeing amazing designers work come down a runway). I am typically a “is it clean? I’m wearing it” kinda girl. It really doesn’t even matter to me if I match, Because matching is, well, overrated IMHO. I also don’t like to do things because the crowd does them. This however, is very different. I am wearing dresses because other people in the world are disenfranchised and need a voice. I have a voice and it has an audience. It may be a small audience of 10-15 per day but it may grow it ways I couldn’t imagine. Here’s where I tell the starfish story. Each year in my sophomore class I have my student’s do a county required research paper. Topics have included but are not limited to: what college do you want to go to, what do you want to be when you grow up, where do you come from, how to buy a bed (or other furniture), etc. Anyway, last year I began to hear more and more about people around the world who were hurting. Why hadn’t I heard about them prior to this or maybe it just didn’t register with me (self-centered often?)? In January of 2014 I got the book The Locust Effect and I have to be honest, I have yet to read past page 20 it is a raw and tough book to read. All the sorrow and suffering contained in those first few pages was enough for me at this point (I will try to finish it because it is important information). I shared a few statistics from the book with my students because last year I decided the random research paper needed to be something of worth and my students wrote papers about social change. They were in awe with the statistics and the paper idea. A couple was walking down the beach in the coming darkness of evening. Every few minutes the man bent over to pick something up and throw it in the water. This happened 5 or 6 times before the woman asked, “What are you throwing in the water? Shouldn’t you put that in the trash?” The man didn’t immediately answer but continued walking and leaned over again shortly to pick something up and showed it to the woman. “See, it’s a starfish.” And with that he threw the starfish back in the water. The couple continued walking along the shore line and again the man bent over to pick up a starfish. The lady asked, “Why are you wasting your time? It is likely that the starfish is already dead.” The man took the flash light that they had been using to help them see a few feet in front of them and show the beam out farther down the surf. “See all the other starfish that are out there? What if they aren’t dead yet and just need help getting back in the water? They all need help. While I may not be able to save all of them, if I try and save one or two or as many as I am able, I have made a difference for those starfish.” With that the lady bent over and picked up a starfish and threw it in the water too. “Now there will be twice as many starfish that will be saved” she said as they continued to walk along the beach picking up starfish and throwing them in the ocean as they went. You may have heard that story before. My students hadn’t. I embellish it and change it a little bit every time I tell it but the basic story stays the same: you only need to rescue what you can and that will be enough. My students took away the biggest part, they can be world changers even if they only reach one person with their desire to make change in the world. You never know what will happen with that one person, how far their reach will go. IJM does what it can but it can only do so much without the help of people like you and me. We are the other person and IJM is the man throwing the starfish. We think he is crazy for a few minutes and then realize his work is important to the greater good of the world. What greater good will you do today? Will you learn more about IJM’s purpose? Will you pray about the people that IJM helps free from suffering and slavery? 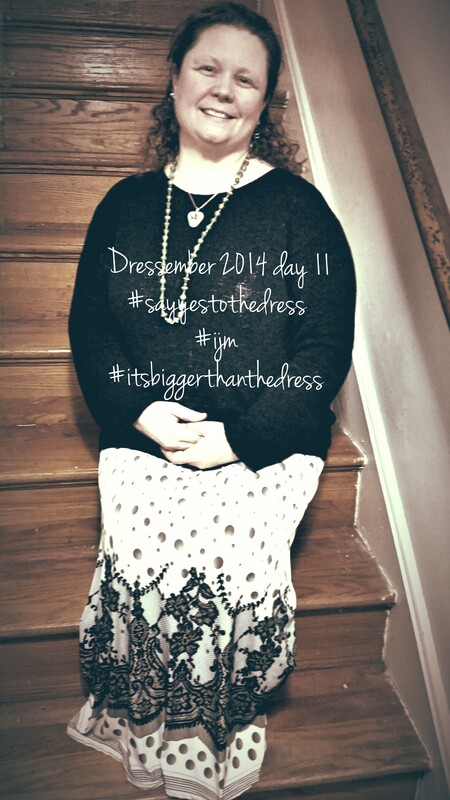 Will you donate to the cause through my giving site on dressember? Will you find and read The Locust Effect? (link to my daughters bookstore website is HERE) What will you do? Please help in some way. There are people out there who need a voice. Be their voice.